A delicious recipe that is perfect to start grilling season back up! We like to make this on the grill. While you can make these in the oven or on the stove, making them on the grill has always been the best option and the one we like the best. Take a large cast iron skillet and add the bratwurst links, quartered onions, and then pour a bottle of Guinness Stout over the ingredients. Place on the grill with a temperature of about 400 and then close the lid. About every 5-10 minutes lift the lid and toss the onions and brats in the Guinness. After about 45 minutes to an hour, you are done. 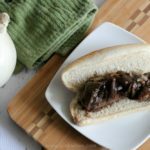 Take a grilled brat and some caramelized onions onto a hotdog bun. Serve immediately.